Genetix Systems | MERRICK Industries, Inc. The capabilities and flexibility of the Genetix platform allows the customer to easily integrate Genetix into their control system. 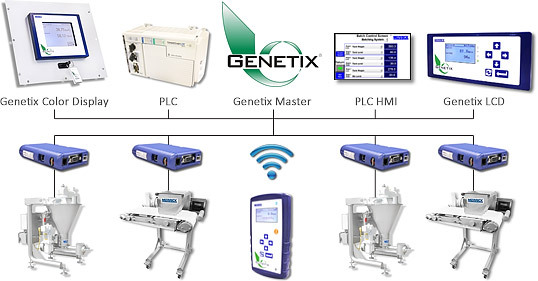 Genetix can handle the control tasks from a single belt scale installation to a complex blending operation with multiple weigh feeders and PLC controls. A single Color Touch Screen Display can access and operate multiple Genetix Core Modules (GCMs) and feeders saving valuable cabinet and mounting space. Using a Bluetooth® Wireless Interface, a single battery-powered Portable Display can access and operate multiple Genetic Core Modules (GCMs) and feeders. This simplifies set-up and calibration of the scales or feeders.